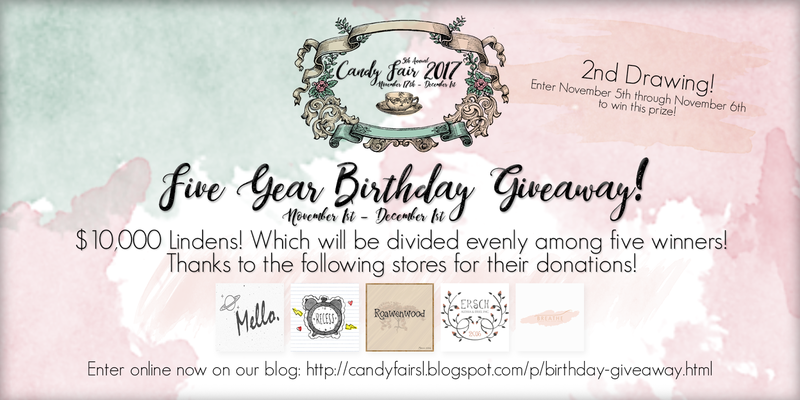 Candy Fair 2017 Birthday Giveaway Drawing #2 Now Open through November 6th! Now open for the 2nd drawing of the Candy Fair 2017 Birthday Giveaway! This rounds drawing is for $10,000L which will be divided evenly amount five winners! So thats $2,000L for each winner! If you previously entered anytime this month already and didn't win the previous giveaway you are still entered for this one and future giveaways this month! Remember you can put your name into the pot ONCE daily! I can't stress this enough if you put your name in more than once you will be taken out of the entire giveaway. Good Luck everyone this drawing lasts from November 5th through November 6th! The winner will be announced on November 7th! Thanks to our sponsors of this drawing for donating the lindens!